How can I edit models? 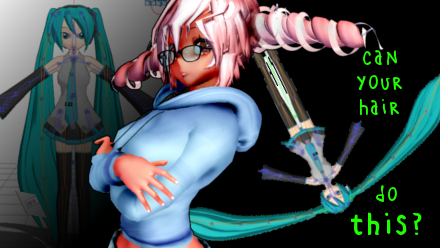 How can I make my selfie model for MMD? What is the PMXE transform screen? 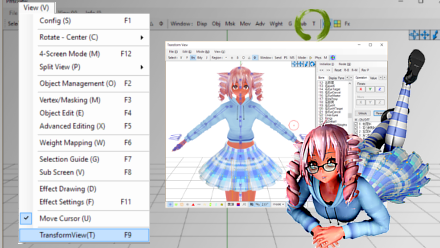 How do I use PMXE to make a model for MMD? 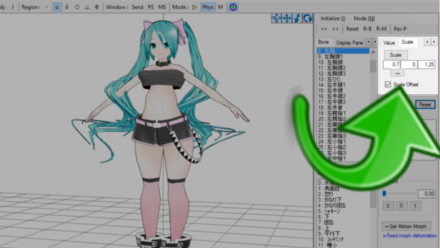 How do I add parts to my MMD model? PMXE comes with a powerful tool in its transform window. Hopefully, you’re familiar with it as a way of quickly checking your weights and physics. 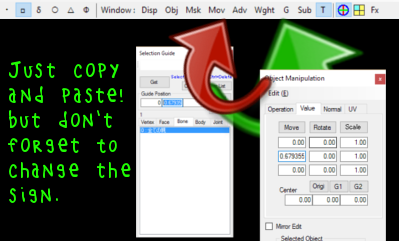 But you might not know that you can use it to simplify a lot of editing tasks! 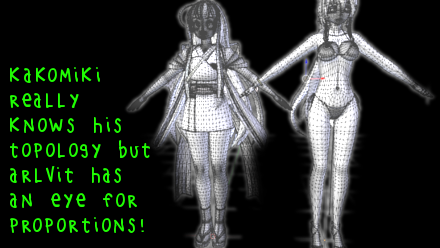 Join Teto and I as we place accessories, fix some physics, make some tights, and give Miku a makeover! I’ve built a physical bikini tie and bound it to a movement-type bone, but it’s not in the right position for my model yet. Rather than placing it via the 3D view, which is a nightmare of masking and physics, I’m going to place it in the transformation view. 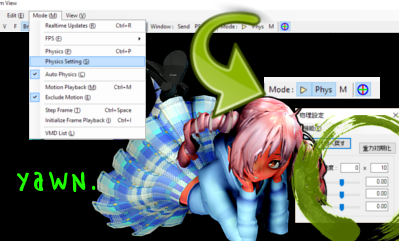 Open up the PMXE transform window with the T button on your 3D view’s toolbar or by hitting F9. Then, select the tie’s movement bone. Now, I can use simple movement and rotation to drag the whole tie to exactly the position I want. The physics get dragged along and I never have to worry about losing my selection. When it’s in the position I want, I make sure that physics are off, then select file->save model on the transformation window. Now, I can load that model, and discover that the tie is exactly where I placed it! Don’t try to use file->save as! I’m not sure why, but it never works. Don’t worry, the transform window’s regular save will rename your model and warn you if you’re overwriting anything. There’s no need to remove the tie’s movement bone. I can use it later if I want to reposition the tie in PMXE or even in MMD. If there get to be too many bones, I can just change its type to hidden. Mostly, meshes are modelled based on how we expect them to look– in full gravity, that is. 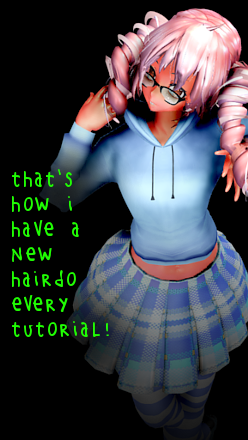 But then, MMD adds gravity of top of this! Our models get hit by double normal gravity. When we make physics to compensate for this double gravity, it’s a little bit off, and we lose some of our model’s bounce. But we can use the PMXE transform window to get physical objects back into position. Enable physics on the transform screen, change your physics settings to disable gravity via mode->physics setting, then drag your model by its motherbone in the Y axis. Inertia keeps the physical bodies in the air, and no gravity drags them back down. When the model is in a pose you’d like, save the transform, then load it. You might want to loosen some joints to prevent the physics from springing back to the default full gravity shape, and you might want to give your model’s physics some time to settle into a stable position– or, you might want to disable real-time updates and advance the frame manually to exactly the position you want! To get the model back into position, check the Y position of your motherbone with the selection guide. Select your entire model, including all of its vertices, bones, bodies, and joints, and raise it all up by this amount. 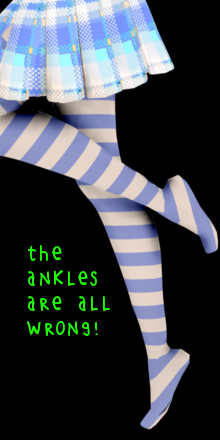 Teto’s been modelling some new tights, but UV mapping tights is a nightmare. You can see that with the standard projection, the stripes don’t look right on her feet. We can make a temporary deformation to get her feet into the right position for a better projection. First, we’ll get rid of all of her IK bones by unchecking IK type, so that her changes will stick. 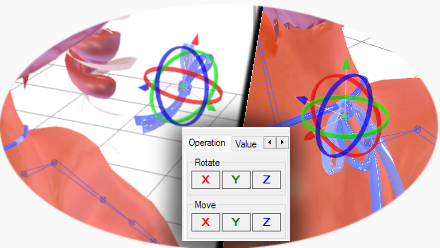 Then, let’s go into the PMXE transform window and apply some rotation to her ankles. Negative 40 degrees in the X axis looks good. Just remember that number so we can undo it afterwards. Save the transformation and load it. Now try UV projecting the tights. Much better! Back to the transformation window, and we’ll apply positive 40 degrees rotation in the X axis to both ankles, then save and load the transformation. Finally, don’t forget to change the IK bones back to IK type. And we’re back to our normal pose, but with properly mapped tights. These kinds of transformations can make a lot of jobs easier. Trying to improve the skinning, but you can’t get the right angle for your linear gradient? Change the limb’s angle to one that works. Using Blender‘s shrinkwrap modifier to make tight clothes? Try shrinkwrapping a posed model to make clothes more or less tight. Stuck trying to decide between a base with a shape that you like, but questionable topology, or one expertly made, but without the right shape? You don’t have to choose, because changing the proportions is a lot easier than you’d think. Okay, now try it again, this time with the upper body bone. See how it scales only the upper body bone and all of its children? For now, let’s just scale by 1,1.25,1, which will make our model taller. On to upper body 2. To undo the scaling caused by UB1, we scale it by the reciprocal of what we scaled UB1. That is, since we scaled UB1 by 1.25 in the Y axis, we’ll scale UB2 by 1 / 1.25 in the Y axis, which is 0.8. (It’s fine to use a calculator!) Now that we’ve done that, we can scale UB2 in any proportions we’d like. Move on through the head and arms, then go to the lower body bone and move through the legs to the feet. When you’re done, save your file, reload it, reposition the whole thing so that its motherbone is at 0,0,0, and restore your IK bones’ functionality. Want to change the face? You can save morphs into the PMXE transform as well. Keep the Faith and credit your sources! I’m using my own Tda Tutor Teto and I tricked her out with MissingPixieSticks’s Pick Up Glasses! You can do it in PMXE using Transform window as described here. The article was originally written for someone who wanted to export models as .obj, but you just have to skip the last step.